The above info came from BH Ouji (aka Big Hamster), and was edited by yours truly (contact me). The image came from animemoon0. 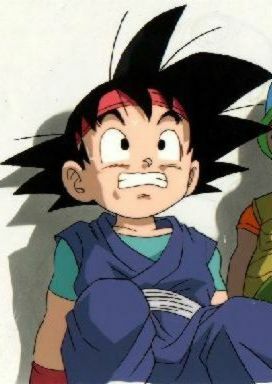 Goku Jr is Pan's Great Great Grandson, and he was named "Goku" by Pan to honor his "Grandpa" Kakarotto. He wears a bandanna (similar to his "Grandpa" Bardock) and can go Super Saiyan. 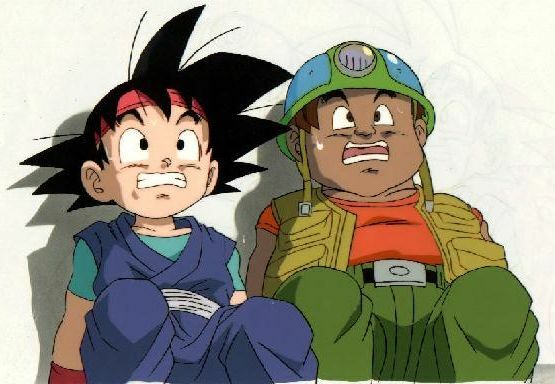 In the TV Special, his "grandma" was ill and he goes to search for the Dragon Balls to restore hear. When nothing works (he has ONE Dragon Ball), his grandpa Kakarotto appeared and told him that he needs 7 Dragon Balls to make a wish. Kakarotto gives him the four star Dragon Ball (something like Grandpa Gohan did to Kakarotto when he was a boy). Later in episode 64 he fights Vegeta Jr, who was Vegeta's "grandson" , however it is unknown who won since the series ends.